A treatise from this popular encyclopedia. R. James Long,( ed.). 1979. Bartholomaeus Anglicus, On the Properties of Soul and Body (De proprietatibus rerum libri III et IV), Toronto Medieval Latin Texts, 9 (TMLT9), Toronto: Pontifical Institute of Mediaeval Studies, 1979. 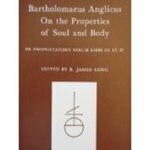 Long, R. James, "Bartholomaeus Anglicus, On the Properties of Soul and Body (De proprietatibus rerum libri III et IV)" (1979). Philosophy Faculty Book Gallery. 7.